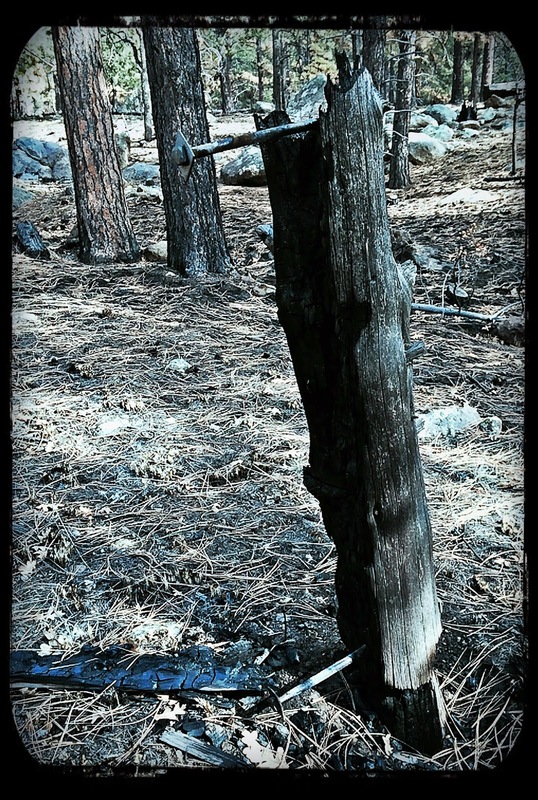 Some time ago I wrote a blog-post about a set of old telegraph poles I'd found near Rocky Ridge Trail and the Elden Lookout Road. Out riding this past Sunday, while passing through an area of the woods that recently underwent a large-scale prescribed burn, I spotted another old telegraph pole not too far off the north-side of the trail I was riding. It was quite charred on one side, but still recognizable as a pole, despite the damage it had recently incurred. Having found one "new" pole (F), I decided to bush-whack up the hillside, heading generally in the direction of the other poles (A-E) to see if I could find any additional, as-yet-undiscovered poles to add to my collection. I only found one more (G). That might be because I missed them, or because all the other ones were burned-up by the fire. Anyway, I think these old telegraph poles are sorta cool. 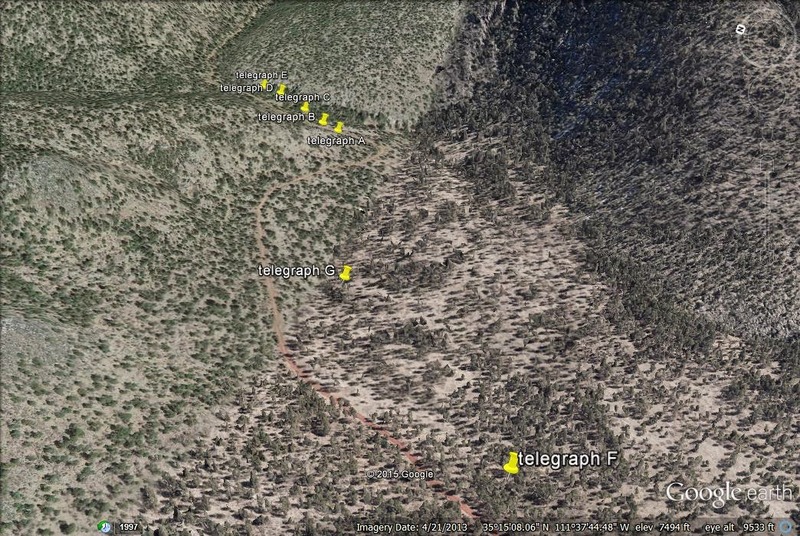 As I said in my previous blog-post about them, "I've always assumed that [these] pole[s] followed the original alignment of the mule trail and functioned, long ago, as a communication line, and perhaps also as a power line, for folks staffing the [Elden fire-lookout] tower." Kinda neat. I'm going to keep looking for more. 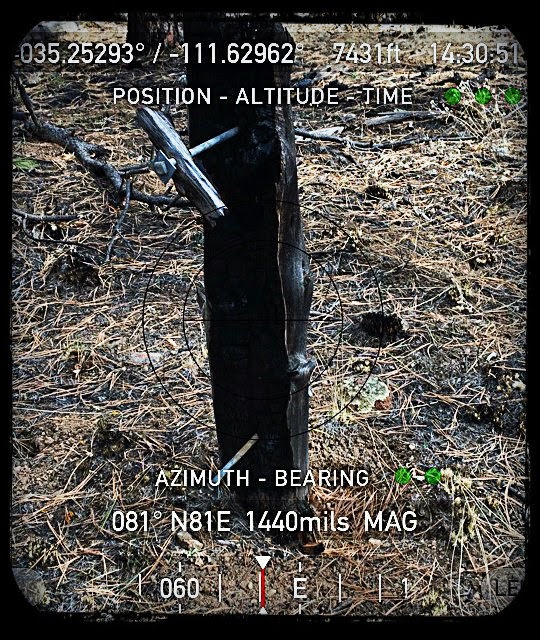 Below is a Google Earth screen-grab showing the location of the poles I know of so far.